Whenever I hear the word Monster, I get reminded of my Monster Cookie. Oh! how funny! I will never forget that experience. But, this time, it was a decent outcome. My Monster Cupcakes looked like a monster! Ha! What an achievement. I made a Ghost cupcakes too! White Icing for eyes and teeth. Black Icing for the eyebrows. Red icing for the lips and pupil. It is one of my first Icing arts so you might find flaws here and there. But hey! it looks like a monster doesn't it? Hey thatz a cute little smiling monster! lovely color combination. what a great idea! Thanks for passing by my blog! This allows me to discover yours - Love your creativity! Hey lovely recipe for coconut cookies. loved the color comi also.. Loved ur icing...cupcake looks delicious..
Lovely and colorful cupcake...very innovative design! good one :) Sangeeth. 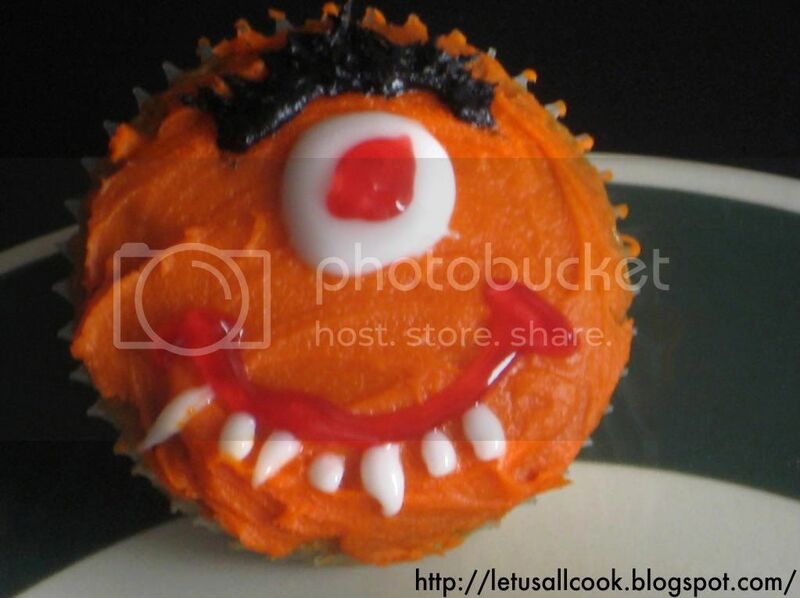 But instaed of ur helloween cookies I smiled for this cupcake the way you showed :)). But you are great looking delicious :).